Well, I would just bump up this question with an edit, but my meta rep isn't high enough. So I'm posting this as a new question. Here's the problem: in the latest stable version of Google Chrome (6.0.472.53) -- now out of beta -- clicking on the "Blockquote" button in the editor results in a strange textual anomaly. Below are a couple of screenshots illustrating this issue. Using the latest stable version of Chrome, navigate to StackOverflow. Open up any page with an editor in it -- either to answer a question or to ask a new question. 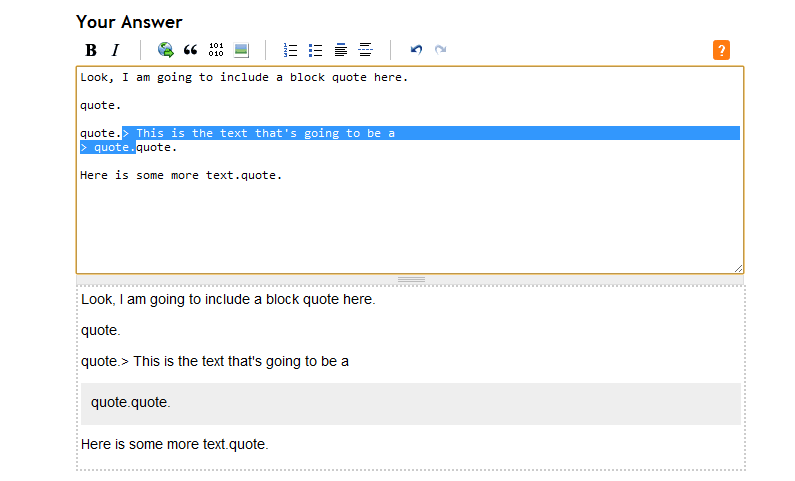 Type and select some text in the editor. Click on the Blockquote button. The above strange effect above always happens, as far as I can tell. The main reason I am posting this is that the accepted answer to the previous question I linked to was "Beta browsers are not supported"; and Chrome 6 is now out of beta. Secretly I added the workaround for chrome 6 only, I upgraded to chrome 7 today and the bug is back. I really don't want to make this workaround part of WMD. Ok, this happens cause of a pretty serious bug in the Chrome 6 regular expression engine. Of course this is totally horrid, and should be fixed in the web browser. This bug also happens to be a heisenbug, when debugging it if your first breakpoint is too early, stepping through shows that everything is good. Unfortunately, this is a bug in Chrome 6 (final), and should be reported to Google. Don't get me wrong, I love Chrome -- it is my browser of choice and I am just as excited as anyone else to have a sweet new version -- but this really is not our bug. The problem seems to be happening in the wrap() call in doBlockquote. Oddly, if I comment it out, the problem goes away and blockquote seems to works correctly in Chrome 6. I'm working with the obfuscated version of WMD and I haven't got the patience to chase down what is really happening here. This indeed is a bug to be fixed by the Chrome. Search the file for "wmd.Chunks.prototype.addBlankLines = function"
This fixes the chrome issue with block quotes and is the fix currently implemented by StackOverflow.com. Not the answer you're looking for? Browse other questions tagged bug status-declined google-chrome editor . Why am I getting undefined text in the Answer text box? Some time when I got upvoted two times I got only 2 points instead of 20. Why?